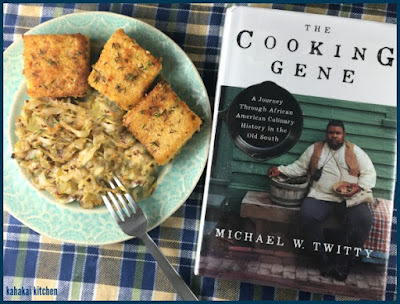 I'm doing my usual trick of coming in at the last minute for our Cook the Books October/November pick, The Cooking Gene, A Journey Through African American Culinary History in the Old South by Michael W. Twitty, hosted by Simona of Briciole. Although it took me several weeks and library renewals to make my way through the book, I very much enjoyed it and the vegan take on African-American cooking that was inspired by my reading. The Cooking Gene is Twitty's homage to the culinary history of his ancestors originating in Africa and Europe and journeying through the Old South and the origins of Southern cooking, and it manages to be both entertaining and thought-provoking. At moments he made hungry, next making me squirm uncomfortably at the uglier moments of our not-so-distant history, then teaching me something new about food before getting me chuckling over his family moments--that while completely different from my own cultural upbringing, often ring with complete familiarity. I love books that give me information--especially when it is related to the history and origins of food and Twitty does it in such an engaging way that had me completely caught up in his journey, and even though I dipped into the book in bits and pieces over the past several weeks, he made the 400+ pages easy to digest (pun intended). "The real history is not in the food, it's in the people. We are working against the loss of our cultural memory; against the consequences of institutional oppression; against indiscriminate and flagrant appropriation; and against the courts of public opinion that question our authenticity, maturity, and motives in the revolutionary act of clarifying and owning our past. It is my belief that the very reason we are hear in space and time is deliberately connected to our journey with food. 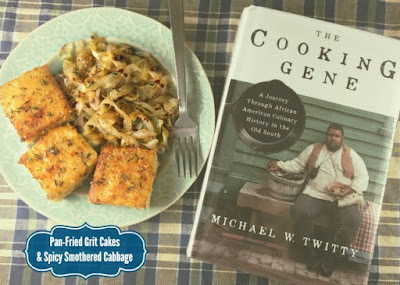 The only question I've ever wanted to answer for myself was, How was my destiny shaped by the history of Southern food?" For my book-inspired dish, I really wanted a lighter version of African-American cuisine as with it being in the thick of the holiday season, I have been indulging far too much already. I turned to Bryant Terry's Vegan Soul Kitchen, a favorite vegan cookbook of mine that I don't cook nearly enough from. 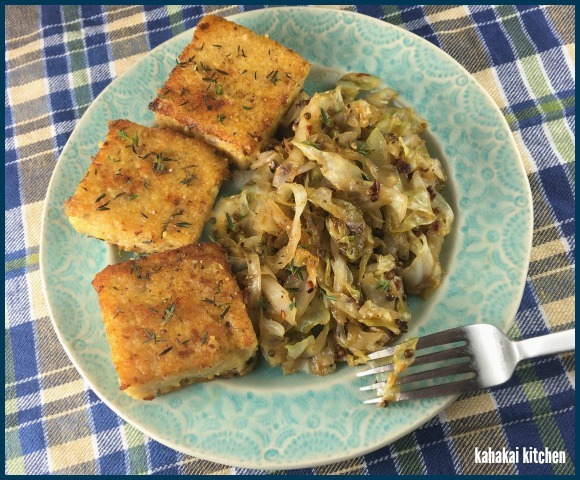 I had been meaning to make the Pan-Fried Grit Cakes with Caramelized Spring Onions, Garlic & Thyme, so I picked them (although I ended up using a Maui sweet onion instead of green onions only because I left them out of my shopping basket) as my main dish. I wanted something to accompany my grit and ended up choosing cabbage over collards (cabbages looked better/fresher at my local grocery store) for Spicy Smothered Green Cabbage. My changes are noted in red below and I've included Bryant Terry's "soundtrack" suggestions for music to cook and eat by. Bryant Terry says, "Because the grits need to set for a few hours before you can cut them, this dish should be prepared in advance. The time invested is well worth it. I enjoy these tasty cakes as a savory dinner side or as a light meal with a green salad. You can omit the spring onions, cayenne, garlic and thyme and reduce the salt then eat these with pure maple syrup as a breakfast treat. Or you can eat them as is with maple syrup like my mom does. For a low-fat version, they can be baked on a lightly-greased baking sheet at 325 degrees F. until crisp, about 15 minutes each side. they can also be lightly brushed with olive oil and grilled for 10 minutes on each side." 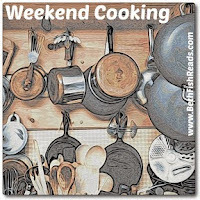 In a medium-size nonstick saute pan, combine 1/2 tablespoon of the olive oil, the spring onion, and the cayenne. Turn the heat to medium-low and saute gently until well caramelized, 10 to 15 minutes. Add the garlic and saute until golden, 2 to 3 minutes. Remove from the heat and set aside. In a medium-size saucepan, combine the milk with the stock, cover, bring to a boil, and boil for about 3 minutes. Uncover and whisk the grits into the liquid until no lumps remain. Reduce the heat to low and simmer for 25 minutes, stirring every 2 to 3 minutes with a wooden spoon to prevent the grits from sticking to the bottom of the pan. Add the spring onion mixture, salt and thyme and stir well. Cook for an additional 5 minutes, stirring from time to time. Pour the grits into a 2-quart rectangular baking dish or a comparable mold and spread them out with a rubber spatula (the grits should be about 1/2-inch thick). Refrigerate and allow the grits to rest until firm, about 3 hours or overnight. Preheat oven to 250 degrees F. Slice the grits into 2-inch squares. Line a couple of large plates with paper towels. In a large nonstick pan over medium-high heat, warm 1 tablespoon of olive oil. When the oil is hot, panfry the cakes for 2 to 3 minutes per side, until they are golden brown and crispy on the outside (do this in batches to avoid overcrowding the pan). Transfer cooked cakes to the plates to drain and then hold them in the oven until all the cakes are cooked. Serve immediately. 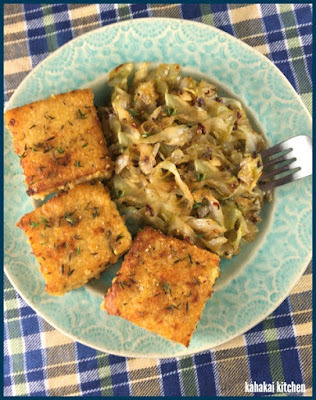 Bryant Terry says, "Rather than frying this cabbage in bacon fat, I add mustard seeds, red pepper flakes, and sugar to the olive oil to add flavor." In a wide heavy saute pan over medium heat, combine the olive oil, mustard seeds, red pepper flakes, sugar and 1/2 tsp sea salt. Cook, stirring frequently, until the mustard seeds start to pop, about 4 minutes. Immediately add the cabbage and saute, stirring occasionally, until it wilts, about 4 minutes. Add the water, stir to combine, cover and cook until most of the water has evaporated, about 4 minutes. Season with white pepper to taste. Notes/Results: The grit cakes were delicious--crisp on the outside, and creamy within and lots of flavor. I did find them a bit dangerous as they popped and shot bits of grit out randomly as they cooked. I tried patting them dry (after leaving them for two nights before I could cook them--I'm not sure if that was the reason they popped so much or not) but I almost got sizzling grits in my eye, so beware! ;-) I just cooked part of my pan and plan on trying baking the rest of them tomorrow to see what happens. I will declare that are worth a bit of physical pain and they were set off perfectly by the spicy, slightly sweet cabbage. It made a tasty dinner and I will happily cook both these recipes again. 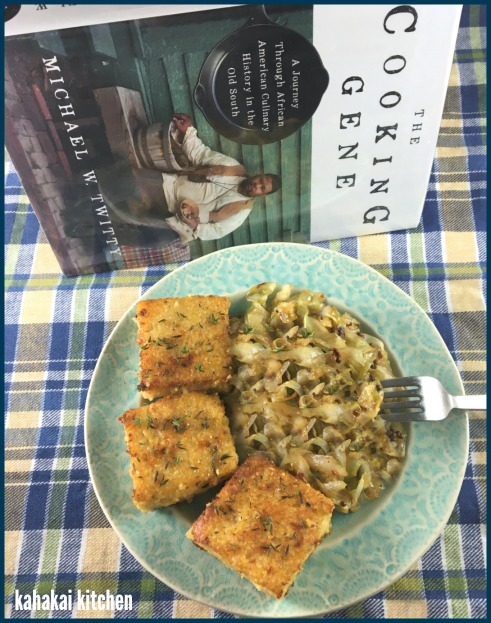 The Cooking Gene is my eleventh foodie book entry for the Foodies Read 2018 event. You can check out the December 2018 Foodies Read linkup, hosted by Heather at Based on a True Story, to see what everyone is reading this month. The deadline for this round of CTB is TODAY and Simona will be rounding up the entries on the Cook the Books site soon after. If you missed this round and like food, books, and foodie books, join us for December/January when we'll be reading the Hawai'i set Island of Sweet Pies and Soldiers by Sara Ackerman, hosted by yours truly, here at Kahakai Kitchen. Oh I'm so happy to see another link to this book -- I really, really do have to read it. And your recipes!!! Yum. What a great combination, Deb. I appreciate the cabbage over collards, too! I love fried grits - the cabbage sounds like the perfect go-with for a simple meal! Yum! Oh no! Grits in your eye! Yikes, I was pulling down papaya with a picker this morning and had a big one hit me in the face. Arnica oil. Your grits recipe sounds so tempting. I've intended to try them for the longest time, wondering if they were all that different from polenta. Deb -- I've been looking for a reason to make grits! I was afraid you were going with collards which are not my fave, but cabbage is and I have some to use this week, so this dish will be perfect. Love your take on the grit cakes. I completely missed the boat on this thinking I had until the end of this month.